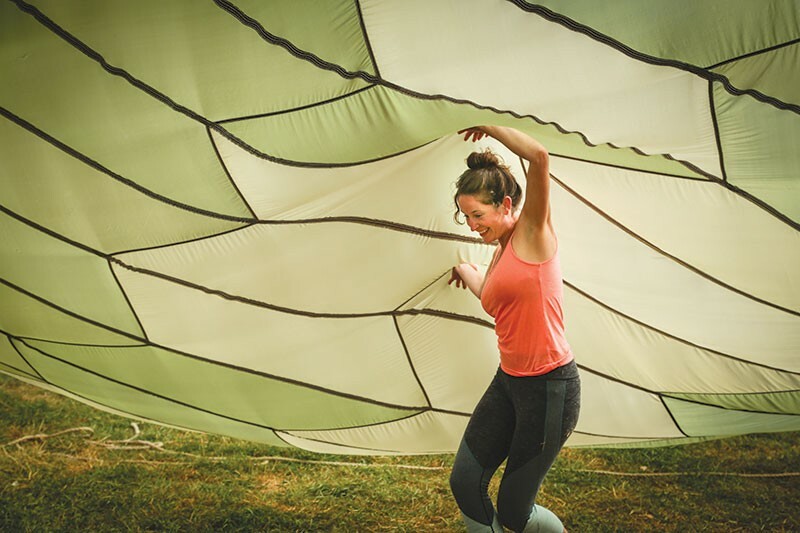 Parachute Days, Saturday, Aug. 26, 2–10pm, at Love Field, 11191 Sir Francis Drake Blvd., Point Reyes Station ($30). parachutedays.com. AW CHUTE Organizers like Leah Fritts have made Parachute Days a must-attend festival. With the 10th annual Outside Lands festival still fresh in the memories of music fans, it would take a really special occasion to re-instill open-air-fest enthusiasm in Bay Area folks. Parachute Days, coming to West Marin on Saturday, Aug. 26, is shaping up to be such an occasion. Crowdfunded and initiated by some of the area's youngest, brightest and most creative minds, it's a day of music, food and community that organizers hope will become a tradition. Behind the festival is a team of five, led by Gabe Korty. With a photography degree from California College of the Arts, Korty used to be a part of an artists' collective called Session Space in Oakland. These days, he lives in Point Reyes Station, keeping himself busy with woodworking, sculpting, writing music and shooting film. Leah Fritts moved to Point Reyes Station seven years ago to work at Point Reyes Farmstead Cheese Co. as marketing and operations specialist. She has since left the company and now manages Little Folkies, which provides classes in folk music for young children, and hosts a radio show on KWMR. Dylan Squires moved to Bolinas in 2010 as a touring musician and set roots as an assistant director for Commonweal, a local nonprofit. Danny Vitali is Squires' musical collaborator; a multi-instrumentalist and songwriter based in Point Reyes Station. Finally, Rachel Pozivenec brings experience in community building, grant writing and production. "In 2015, me and my friend Benny started the parachute project idea by collecting massive pieces of driftwood to build a center support for a 64-foot-wide parachute," Korty says. "Then we approached Tyler Love, the owner of Love Field"—a former baseball field in West Marin County that previously hosted the Far West Fest—"and asked him if we could use the space." Love said yes, and the two held a potluck community event. In 2016, the Love Field potluck added bands to the mix, and Korty received multiple requests from the community to put up the parachute again. Vitali utilized the 2016 festivities to host his record-release show, which became the first ticketed Parachute Days concert. This year's festival boasts a varied musical lineup including Here We Go Magic, an indie band dreamt up by Point Reyes Station resident Luke Temple. Big Sur psyche-pop band the Range of Light Wilderness, Bolinas ethereal pop artist Kacey Johansing, Minnesota songwriter Paul Spring and others also appear. "We are all pretty big music nerds," Fritts says. "We wanted to curate a collection of bands for the community and other folks in the Bay Area that felt unique to us."